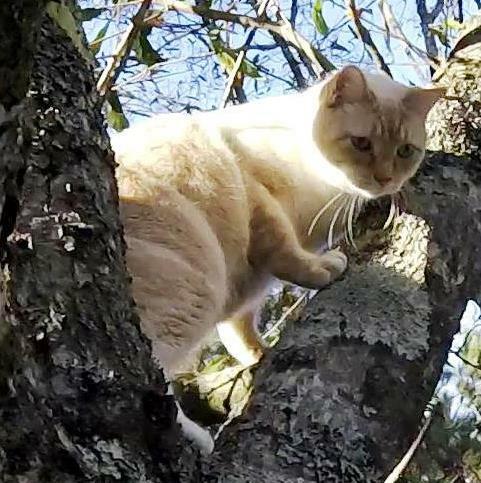 It was Christmas day, and Simba slipped out the door and was immediately chased up a tree by the next-door neighbor's rambunctious dog. I have rescued Simba four times before, so Kerry and Shelley already knew who to call, but they debated about whether they should even tell me about this on Christmas day. Fortunately, they did, but they were not expecting me necessarily to be available or willing to rescue Simba that day. To me, however, that was a wonderful Christmas present. I love rescuing cats out of trees, so I was not only willing, I was happy to go right away. 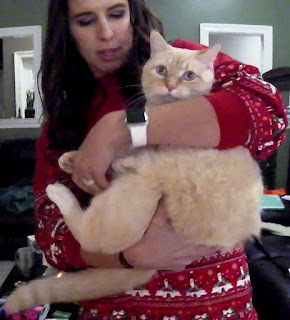 And to rescue Simba, one of my most favorite cats ever, made it even better. When I arrived and told the apologetic family that this was a wonderful Christmas present, they all laughed, but I was serious. Simba is a very friendly, laid-back and docile cat, and his first four rescues were all easy. I expected Simba to be easy to rescue this time too, but with cats you never know for sure. This time he was about 30 feet high near the top of a small tree, and there was nothing above him I could easily use to attach my rope. My best branch to use for a tie-in was the one on the opposite side of the tree where he was perched. I would have to aim my big sling-shot very carefully to make sure I don't hit him when I install my rope. Fortunately, I aimed well, got my target branch and installed my rope without ever disturbing Simba. The rest of the rescue was routine. I climbed up to him, and, as usual, he remained relaxed and readily greeted me. 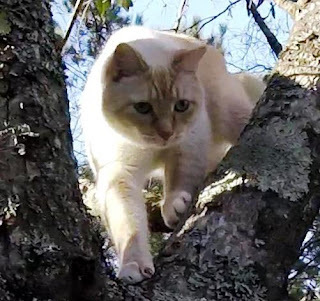 I pulled myself up a little higher, secured myself in the tree and visited with Simba a few minutes. He is such a pretty cat with that very thick fur and beautiful blue eyes. His eyes never come out in my rescue videos and pictures, so you have to see him in person to appreciate it. The first two times I rescued Simba, he came down in my lap, but that was in a tree with a short and clear path down. This time, however, there were numerous and aggravating small branches that we would have to push through on the way down, so coming down in my lap was not advisable. I pulled up the carrier to see if he would go into it. He looked inside once and then pulled out. I petted him some more and put the carrier up to him again. This time, he seemed more interested in standing on top of it. I discouraged that and made him get back down on his perch. Then he looked inside the carrier and, without hesitation, walked all the way inside. I closed the door and brought him down. I carried him back to the house, and we set him down just inside the back door next to their beautiful Christmas tree. There were several people there all enjoying the holiday together. I released Simba, and Shelley picked him up to love on him. She then gave me a small box of tasty goodies to take home with me to say thank-you for rescuing Simba. The contents of that box somehow mysteriously disappeared on my drive home. Simba is now tied again with Kitty at five rescues each. The battle for first place continues.